A civil servant with a short temper must save his girlfriend from a gangster in this pre-Code comedy. Plus the short 'The Dancing Millionaire' (1934). 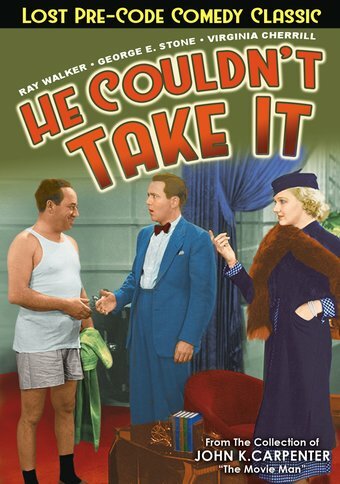 Leading man Ray Walker makes his screen debut in He Couldn't Take It, a charming pre-Code comedy. He would go on to star in a series of 'B' pictures such as The Mouthpiece (1935) and Bulldog Edition (1936). By the late 1930's, he was relegated to supporting and uncredited roles, but worked steadily in film and television for three more decades, most notably as a shopkeeper in Frank Capra's 1946 masterpiece, It's a Wonderful Life. Virginia Cherrill played the blind girl selling flowers in Charlie Chaplin's City Lights (1931) and was Cary Grant's first wife. The $50,000 alimony payment she received after their divorce in 1935 was sufficient enough that she retired from acting shortly thereafter. George E. Stone and Stanley Fields play parodies of their characters from the Warner Brothers gangster classic Little Caesar (1931). BONUS: The Dancing Millionaire (1934): To prove his sophistication, a brutish gangster enlists two working girls' help in winning a dancing competition. An installment of RKO's "Blondes and Redheads" comedy series, The Dancing Millionaire stars ingenue Dorothy Granger, who also appears in He Couldn't Take It. Starring Dorothy Granger, Carol Tevis. Directed by Sam White. From the Collection of John 'The Movie Man' Carpenter.